An increase in the number of recent, high-profile data breaches resulting from Advanced Persistent Threats (APTs) demands that information security professionals evaluate their organization's readiness to defend against APTs. 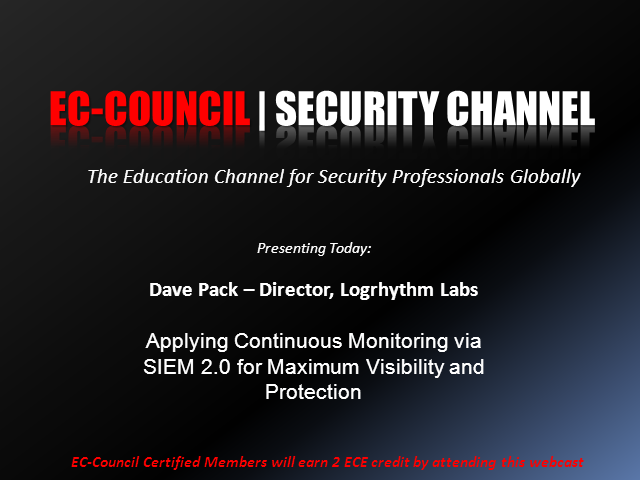 Join LogRhythm's Manager of LogRhythm Labs, Dave Pack, as he shares his experience working with clients to detect and respond to sophisticated threats, observations from recent attacks and recommendations for Response and Control. Recommendations for a well-planned strategy for continuous and comprehensive monitoring with the optimal set of controls to help you protect your organization. Learn how coupling a SIEM 2.0 Continuous Monitoring architecture with a combination of physical, social and digital processes can form the cornerstone for effectively combating APTs.